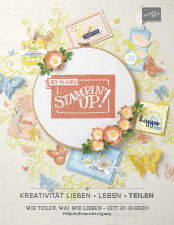 Hallo, willkommen zum zweiten Durchgang des Stamp ’N Hop Blog Hop! Ich heiße Ilka und Du bist gerade bei mir im Südwesten von Deutschland gelandet. 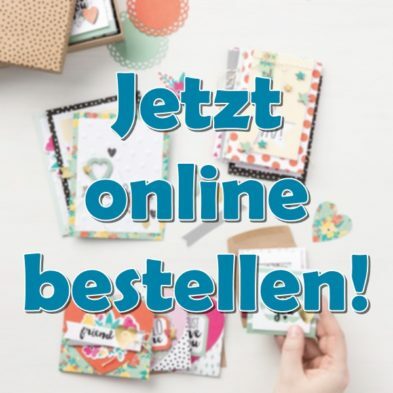 Diesen Monat stehen die Gratisprodukte aus der zweiten Sale-A-Bration-Ausgabe im Rampenlicht. Steht da „gratis“? 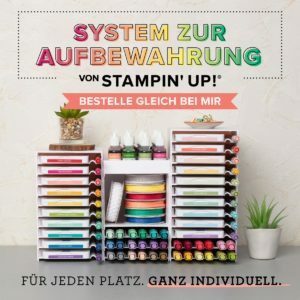 Na klar, während der Sale-A-Bration kannst Du Dir für je 60 € Bestellwert einen der SAB-Artikel aussuchen und bekommst ihn geschenkt! Klicke hier für alle Informationen dazu – die Sale-A-Bration läuft noch bis zum 31. März, also greif schnell zu! Für mein Projekt war mir sofort klar, dass ich das traumhafte Designpapier Frühlingsglanz benutzen wollte. Die hübschen Motive sind kombiniert mit dem Metallic-Effekt wahnsinnig toll, und da ich bei meiner Bastelei ein klitzekleines bißchen Kupfer-besessen bin sprang mir das Blumenmuster sofort in die Hände. Als ich mit der Karte anfing hatte ich nur eine grobe Vorstellung was ich machen wollte, in der Art „ooohhh, eine von den Blumen irgendwie mit dem Korbmuster kombiniert…“ und dass sie sich schräg öffnen sollte. Es war gar nicht beabsichtigt nur Sale-A-Bration-Artikel zu nutzen, letztendlich bin ich selbst überrascht wie viele ich tatsächlich benutzt habe. Das zeigt mal wieder wie toll die Produkte sich ergänzen und wie einfach sie kombiniert werden können! 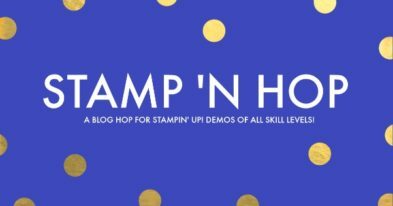 Hi and welcome to the second edition of Stamp ’N Hop blog hop. I’m Ilka and right now you hopped over to me in southwestern Germany. The spotlight this month is on the second release items of Sale-A-Bration, and best of all: you can get them for free! 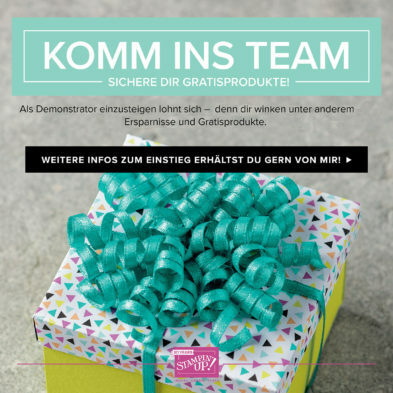 Until March 31 every 60 € spent on an order earn you a free item from the Sale-A-Bration brochure, so check it out quickly and go grab your freebie! 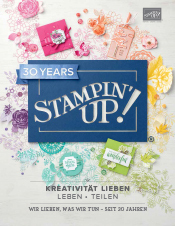 I knew immediately that I wanted to use the wonderful Springtime Foils Specialty Designer Series Paper for my project. 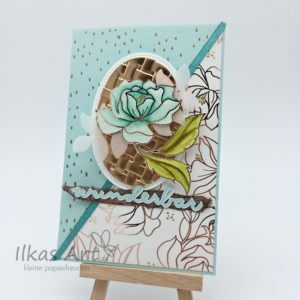 The lovely designs combined with the metallic foil are gorgeous, and as I seem to have a slight obsession with everything copper when it comes to crafting it was an easy decision to go for the flower pattern. I only had a rough idea for the card when I started, something along the lines of „oohhh, one of the flowers on a basket weave piece“ and the diagonal opening. It wasn’t my intention to use only Sale-A-Bration items, but in the end I’m suprised how many I actually used on the card. This just shows how great the different products go together and how easy they can be combined! Eine einfacherere Version wäre, die dreieckigen Teile einfach auf einer normalen, rechteckigen Kartenbasis aufzukleben und die diagonale Öffnung wegzulassen. Die Karte wäre in Windeseile fertig! An easier version could be to use a regular card base, stick the triangular pieces down as a pattern and skip the diagonal opening. The card would be done in a breeze! Beautiful colours and what a great fold, lovely project. I so agree that the SAB items go together well. Your card is stunning! wow! that’s one beautiful card! Wow what a stunning card! Thank you for sharing! I love your use of the Basket Weave embossing folder. And that paper is my favorite! Absolutely beautiful! Side note, I love the easel to showcase the card like the artwork it is!! I absolutely love your card and the wonderful fold idea! I will be CASEing this card soon. 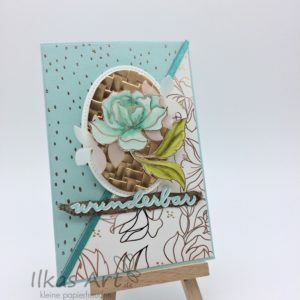 Very pretty card and fun alternative layout! What a lovely project, love all the details you put into it! The colors and textures in your card are absolutely beautiful. Everything works together incredibly well. Thanks so much for sharing! 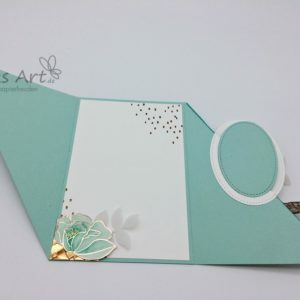 Such a beautiful card and love the fold of your card! What a lovely card! Just beautiful!